Some of the most sustainable agriculture systems in the world are water based. Other societies rely on cultivated mono fish farms or commercially caught sea fish. There are some very good reasons why we should not buy into these types of systems. An ever increasing number of unsafe chemicals are being found in fish from these systems. Commercial harvesting from lakes and oceans is causing serious damage to ecosystems and depleting the world wide stocks of such animals. It is suggested that up to 30% of our fish stocks are now gone. By not buying commercially caught fish we are helping preserve the ocean and river wilderness. Most commercial fish farms are also a bad choice as they produce fish in the same type of monoculture seen in conventional agriculture. These systems are subject to the same kind of problems we see in other monocultures, high amounts of pests and diseases which leads to an increasing number of chemicals used in addition to huge energy consumption. A more balanced home scale aquaculture system is a way of receiving animal protein without the need to eat red meat, a system usually associated with large scale cattle production which is decimating the planets ecosystems and water sources. Small scale aquaculture can also utilise marginal land that may not be particularly suitable for other growing methods. Vertical space can be used and organic waste products or manurial inputs can be converted into animal proteins at a efficient rate. Fish, because they are grown in water, use less energy to convert plants to protein, due to their ability to float, and plants grown in wet system give extremely high yeilds due to constant contact with the thing they need most – water. This water can then be used in conjunction with food grown on land as it now contains high levels of nutrients. The best example of this is the ancient chinampas of Mexico also adopted in Kashmir and Thailand. Here is an example of a small scale holding that integrates aquaculture into the system. Do you want to grow some oranges, but you live in a cold climate? A pond absorbs heat during the day from the sun, then releases at night, so frost is less likely to occur on plants right next to the warmer water source — the pond. This allows you to grow citrus, flowers and other plants that require shorter frost times. The Louisiana crayfish, first introduced in fish ponds in Spain in 1973 (Habsurgo-Lorena 1983), rapidly invaded Europe and tends to be superabundant whenever present (Arrignon 2004). This species is particularly well adapted to Mediterranean wetlands because it can tolerate long dry spells thanks to its burrowing habits and dispersal behaviour. In addition it is much less sensitive to salt than other crayfish species. The Camargue has been invaded by this species since at least 1995. Exotic crayfish species are an example of the paradox of invasions because they may benefit populations of emblematic and popular predators such as herons that feed upon them. For example, herons in the Camargue have flourished as it is now. For example, among the six common prey categories of the Eurasian bittern (Botaurus stellaris), the Louisiana crayfish contribute to up to 80% of the diet. This invading species contributes to the increase of populations of this rare species, as shown by a correlation between bittern density and crayfish abundance (Poulin et al. 2007). The Camargue is probably the only location in the basin where the nine European species of herons (Ardeidae) currently breed—bittern, little bittern (Ixobrychus minutus), night heron, cattle egret (Bubulcus ibis), squacco heron (Ardeola ralloides), little egret (Egretta garzetta), great white egret (Ardea alba), grey heron (Ardea cinerea), and purple heron. In fact several species of mammals, reptiles, fish, and birds have switched from a fish diet to a crayfish diet (Barbraud et al. 2001). Unfortunately the ‘negative side of the coin’ is undetected and irreversible damage to ecosystem functioning, causing severe damage to many communities of invertebrates, especially larvae of dragonflies and several families of aquatic beetles, such as Ditiscidae and Hydrophilidae. This crayfish is also responsible for a strong decline of amphibians, both frogs and newts. In addition, because the crayfish also grazes on higher plants, it has transformed many marshes from macrophyte-dominated clear-water bodies to turbid phytoplankton-dominated waters (Rodriguez et al. 2005). “During the 1990’s and the first decade of the twenty-fisrt century, there was an increasing tendency to question the origin of plants introduced into gardens and agricultural systems, with the assumption that natives are always better and that nn-natives might suddenly take over and wreck ecosystems. Now, nobody can argue that there haven’t been instances of introduced plants causing problems – for example, Japanese knotweed in the UK – but the full story is much more complex.Japanese knotweed in a good example, as it is also a nice perennial vegetable (the young shoots are eaten as a vegetable in Japan); however, I have not included it in this book as not only is it unwise to plant it in your gardens, it is also illegal to do so in the UK. This plant has covered several hundred acres of land here. But wait a minute – compare that with the most troublesome invasive plant in the UK, bracken, which is covering 40,000+ hectares and is entirely native. The fact is that in the UK we have a poor native flora compared with main land Europe, and we could not possibily feed 60 million peple on available edible native plants – we have no choice but to eat non-natives, which currently include wheat, barley, onions, garlic, potatoes, sweetcorn, squash, carrots, parsnips and most brassicas. Breeding fish is only part of a healthy aquaculture system. There are many other factors that help keep the system healthy and productive – plants, bacteria, insects, trees and other animals will all be taken into consideration. My design needs to be as self-maintaining as possible so increasing the amount of edge which will in turn produce more food and more habitat for diversity. The system needs to be healthy which means I need to include plants that have different habits and niches, creating plankton, leaf material, habitat for other animals, manurial input, frogs, fruit for food, people, bacteria, insects and trees and more! A healthy pond will be a light green colour which means there is plenty of plankton and other foods for the fish that need it. A manurial input is an excellent way to promote this. Some shade is needed, preferably half a day. This keeps the water cooler which in turn increases production. I will need a nice mix of water plants to give habitat to small fish, feed the fish, provide rotting leaves for plankton and bacteria, clean and oxygenate the water whilst providing food and materials for us people. I don’t think there is enough space for a predatory fish so a herbivore to keep the water clean and crayfish for human consumption will be about the limit. This will rely on Amanda and Dino to keep stocks in check. Different species have different feeding habits which utilise different niches just like plants do. I will need to provide food in the form of insects, bacteria, plankton, plants and algae which is all best included in the system. Once the system is established it should look after itself. The job of the guardian will be to observe the nature of the system and look out for signs of unbalance. The system I am going to present will certainly be an experiment with the need to constantly keep an eye on how things are going. Algae is very high in nutrients though and can be used to make plant feed, added to compost or fed to animals. This goes for the duckweed and azolla too which makes a great mulch or can be fed to ducks and chickens. During sunny days plants are creating oxygen and absorbing carbon dioxide. When there is no sunlight this process reverses (respiration) and the plant exhales carbon dioxide and takes in oxygen. 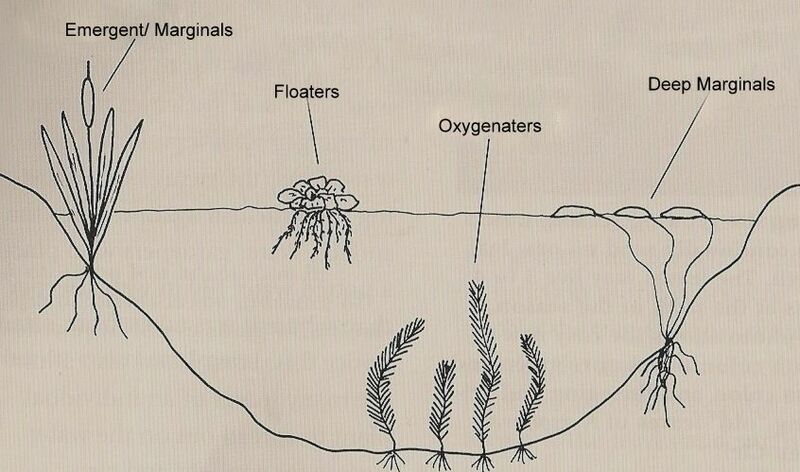 Aquatic plants act the same, but the exchange of carbon/oxygen takes place in the water body. It Is important to consider the levels of carbon and oxygen in the water and understand their implications in order to achieve a healthy and stable system. During periods of cloudy weather the plants cannot photosynthesis and are in fact taking oxygen from the water and producing carbon dioxide. The balance of the pond’s production of O relative to C is thrown off. When pond surface is covered by too much growth this also reduces the ability for the lower plants to photosytnthesise and reduces the area on the surface for the water to take in oxygen from the air. The shedding of dead leaves, other organic matter falling into the pond and excrement from pond life also contribute to this relationship between C & O as the bacteria that decompose this material use oxygen further depleting levels. In what proportion do I need to add the plants? The plants that can cover the water surface inhibit excess light feeding the algae and I will aim for these to cover 60% of the surface. This will allow sufficient light through to lower levels plants. Submerged plants should be distributed 1 bunch per 1/5th of a square metre. These plants are oxygenators and will keep nutrient levels suitable. I will have to monitor levels of fish and amphibians, as natural predators are fewer in this situation as Amanda and Dino will be the apex predators. Too many fish in the pond will disrupt the balance. A stable system is the result of natural succession and a natural healthy system needs to evolve. The system will have to find it’s natural balance with a few tweaks here and there like eating fish for food, organic removal for mulch, algae control for chicken food. I am also considering the following fish but realise that the system will need to find it’s own balance before these can be added. European crayfish (Astacus Astacus) – great food, need habitat, feed on insects and plant matter in the pond. Swan Mussel (Anadonta Cygnea) – great food and excellent processors of water. Grass Carp (Ctenopharyngodon idella) – edge feeding clean up fish and great to eat.